The Inflatable Neck and Back Lumbar Travel Pillow from AirComfy is a thoughtfully designed pillow that provides support in subtle ways. But does it do enough? Read on for my full review. This inflatable travel pillow for neck and lumbar support is made by AirComfy, a travel product company that also makes the AirComfy Daydreamer Inflatable Neck Pillow. See how AirComfy fares in my best travel pillows comparison page. I think the best way to describe the this Inflatable Neck and Back Lumbar pillow from AirComfy is that it is unassuming. Its shape and inflatable nature make it seem like it is just another travel pillow. 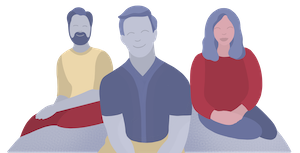 However, its specific design and features bring a good amount of support in a discreet package. The pillow comes in Black or Taupe. 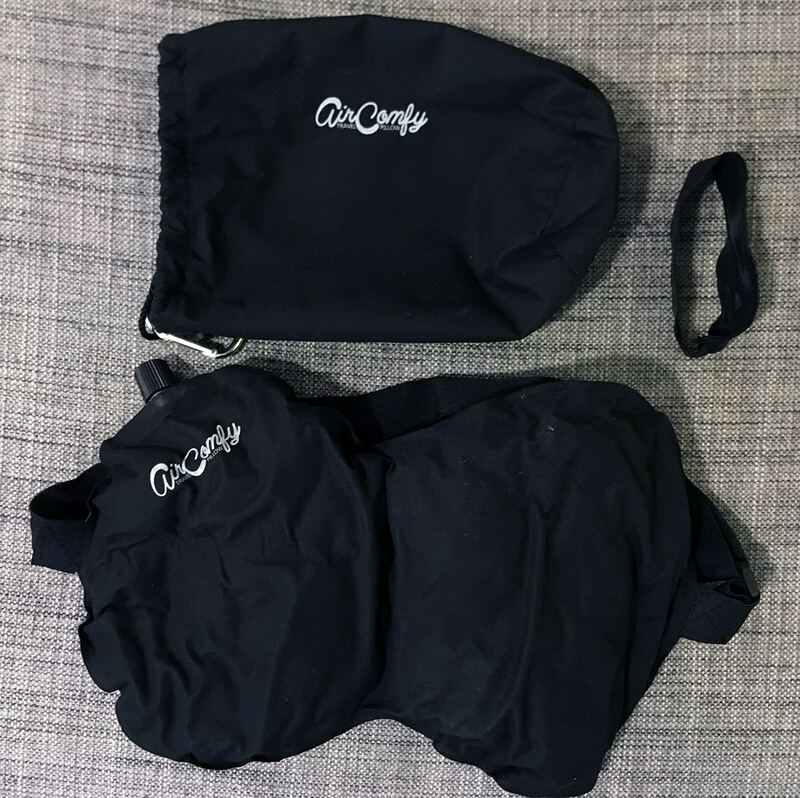 It arrives in its travel packsack, complete with a carabiner (called a “luggage clip”) so you have several options for ways to carry it with you. Because it is inflatable, the pillow is very compact and can be deflated, rolled and put it a suitcase. 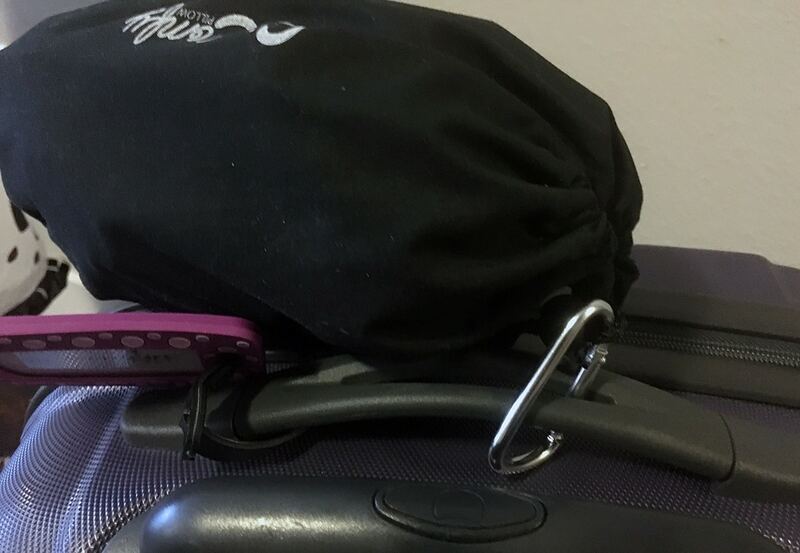 It can also stay inflated and connect to luggage with the clip or by draping the elastic band over the handle of your suitcase. The tag on the pillow says the pillow is self-inflating. 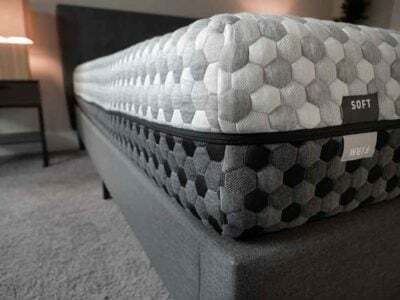 In order to “obtain the cushiest support (and make the self-inflate feature fully functional),” you need to let the pillow remain inflated for a day so the foam filling inside can reach its capacity. To be honest I got impatient and decided to let it half self-inflate and half inflate myself by blowing into the pillow’s valve. 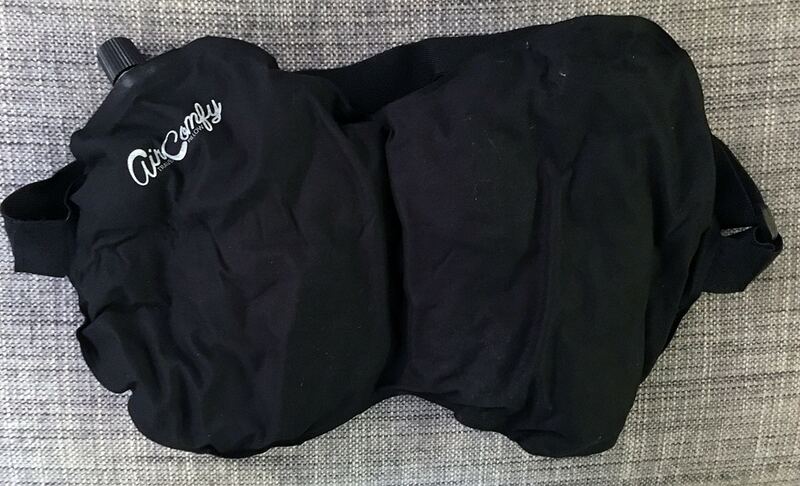 Unlike the SkyRest pillow that has a valve that doesn’t let air escape during inflation, I lost a lot of air in the pillow in between breaths with this pillow. I was able to inflate it in just a few breaths and also found that I could deflate it in a matter of seconds. Because there is foam in the pillow’s filling – and because it is self-inflating – the pillow does try to re-inflate when you are squeezing the air out. I needed to twist the valve off quickly to avoid air re-entering the pillow. The elastic band attached to the pillow is adjustable and allows you to strap it to a headrest. 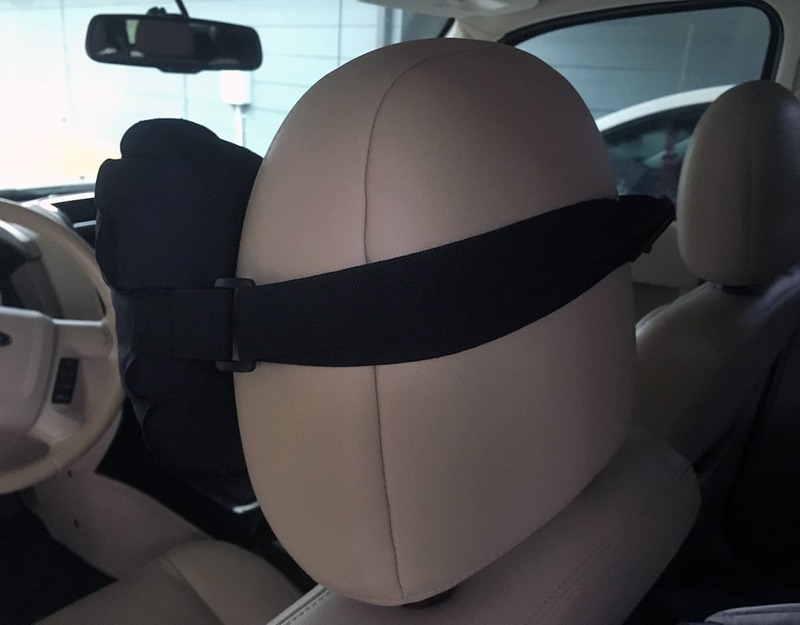 I tested mine in the car but I think it could work well on a plane or train. This allows the pillow to be anchored to the headrest. If you have the opportunity to recline, I think this pillow could be even more comfortable. It has a small inward slop in the center, which stops your head from tilting to the side. 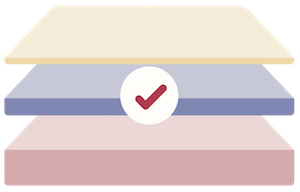 Side sleepers won’t get a ton out of this feature as it is subtle, but it works. For those looking for any type of back and lumbar support, the pillow can be easily anchored to an office or desk chair and will stay in place to provide back support. I think this option enhances the pillow’s versatility and provides comfort in both areas. 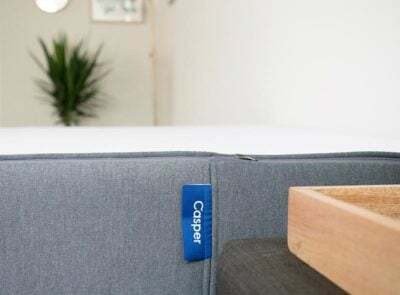 You cannot machine wash or dry the pillow, you must wipe it down with a damp cloth, according to AirComfy. As someone who hates germs, especially in shared spaces like a plane, train or bus, I wish I could throw it in the wash. I would want to wipe it down with some sort of antibacterial wipe rather than just a damp cloth. When I did wipe it down I found no black dye transfer so I wouldn’t be too concerned with anything rubbing off on your clothing. Overall this inflatable pillow from AirComfy provides solid support for both your neck and your back. The elastic band allows you to strap it to a chair or headrest and creates an anchor so the pillow won't move while you a resting. The cover fabric is not the softest but feels durable and is not slippery. 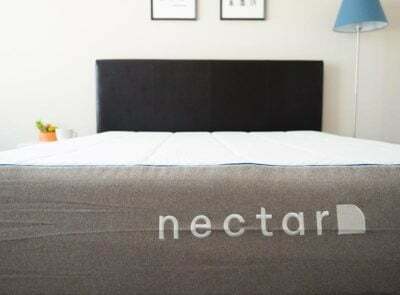 The pillow has both air and foam filling for nice and adjustable support. The pillow cannot be machine washed or dried and must be hand washed with a damp cloth. A reviewer had trouble fitting the elastic strap around the headrest of a plane. 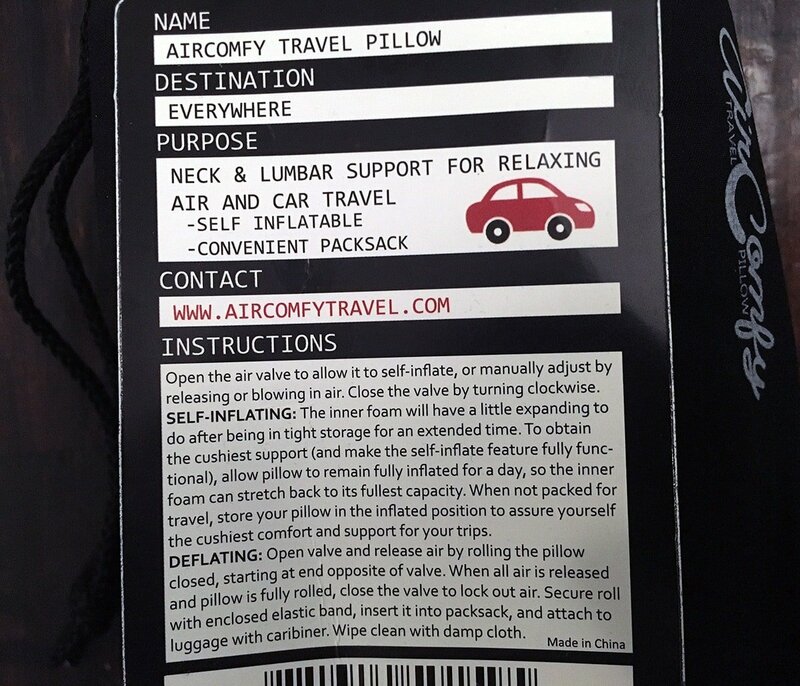 According to the response from AirComfy customer service, the travel pillow’s elastic band may not fit around business class seats. They do say it is designed to fit seats/headrests up to 49 inches in diameter. Another customer said the pillow did not self-inflate after 24-hours and they needed to use the nozzle to inflate at every use. 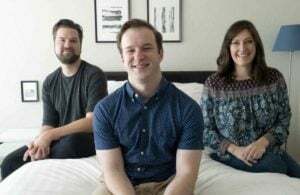 The pillow’s fabric is not very soft or plush and some travelers may consider purchasing an alternative cover to place over the pillow for more comfort. 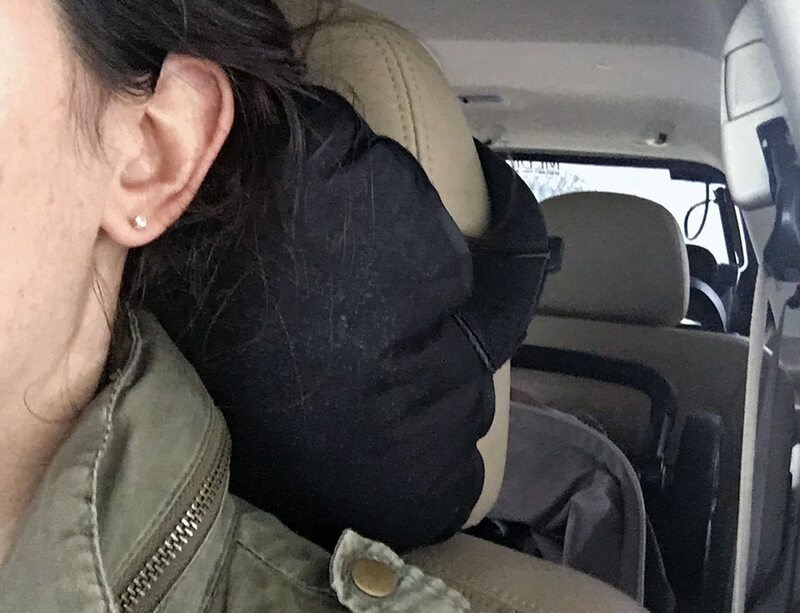 You can purchase the travel pillow off Amazon for $19.99. The retailer says the original price is $29.99. I did not see the pillow for sale elsewhere online. 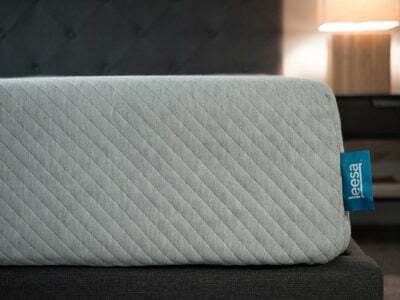 The unique shape of the pillow and the combination of air and foam in the filling set it apart from other neck pillows. The ability to anchor it to a headrest or a desk chair is also a plus. 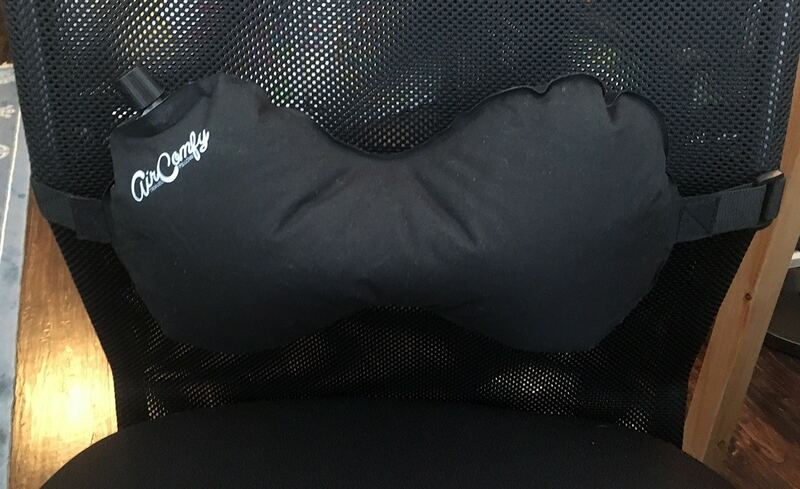 For these reasons and the reasonable price I would recommend this travel pillow as a supportive but comfortable travel pillow for anyone looking for back or neck support.